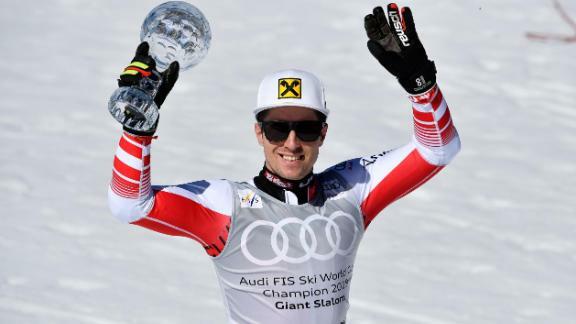 The Austrian ace has won skiing's World Cup overall season title for an unprecedented eight years in a row alongside countless other honors in a glittering career. READ: Marcel Hirscher: Skiing's greatest of all time? Hirscher and wife Laura had their first child -- a boy -- last year, and priorities have changed. "Ski racing is not the most important thing any more," Hirscher told CNN's Christina Macfarlane for Alpine Edge at the World Cup finals in Soldeu, Andorra. "This is maybe the hardest decision in my life because I'm not saying, 'OK, I'm going to jump into a new job,' I'm going to end a part of my life which has been today, my life. "If you have done this for 10 years with this intensity, with tears, sweat, success and suffering, all the ups and downs. It's not easy to say 'Ok, I'm done with it.'" At an average of eight wins a year for the past eight years, he could surpass Stenmark and cement his legacy as the GOAT in a handful of seasons. That's if American superstar Mikaela Shiffrin, who has already thundered to 60 World Cup wins, doesn't pass him in the meantime. But that's at least two more years of pursuing the unrelenting goals of an elite athlete, trying to stay ahead of the chasing pack. "The biggest challenge is to improve yourself year by year," said Hirscher. "The others are not sleeping." The grind, travel and familiar rhythm of the ski circuit is another factor weighing heavily on Hirscher's mind. "Knowing on December 25 I'll land in Denver, five steps, turn left and there is the parked car and go to Vail for four or five training runs, dinner at the same restaurant," he says, reflecting on his routine. "I'm used to those rituals during the season and this can be sometimes as well frustrating and is not always motivating, knowing what I'm going to do." Talking in Soldeu, Hirscher admitted he was glad the season was over, but he said it wasn't the right time to make a definitive decision on his future. "Today is the wrong day for this question," he said. "At the moment I have no motivation. But it can change in one or two weeks. "Right now I feel brilliant, my body, my mental side, we have so much experience, we are all getting better and better, the team is growing more together, we're not at the peak, it's really the toughest situation so far in my career. "I don't want to stop ski racing by saying I'm not anymore in the top 15 and now I have to stop. I want to stop because I've made the decision that I have no fun anymore or I'm tired of ski racing." Growing up in the small town of Annaberg in eastern Austria, Hirscher didn't see himself as exactly on the fast track to greatness. When he joined the World Cup tour at 18, a single victory would have represented career success. "Where I grew up nobody had done that before," he said. "It would be something you can be proud of and maybe one medal at a world championship. Wow. "I dreamed never too big. I hate to dream really big and at the end of your career have just reached one percent of big dreams. That's not fun. Better to have small dreams and live it big." Whether he retires or carries on in search of the all-time record, it will be on his terms -- and now those of his wife and son, too. "It's more important he's doing good and everything with the family is good, then comes ski racing," he said.